Alonzo Johnson ran the leadoff leg for the 4×100 relay. Ahmad Wagner ran the anchor leg for the 4×100 relay. COLUMBUS — Team chemistry is an absolute must in the execution of a good performance for the 4×100-meter relay, especially at the state track meet. 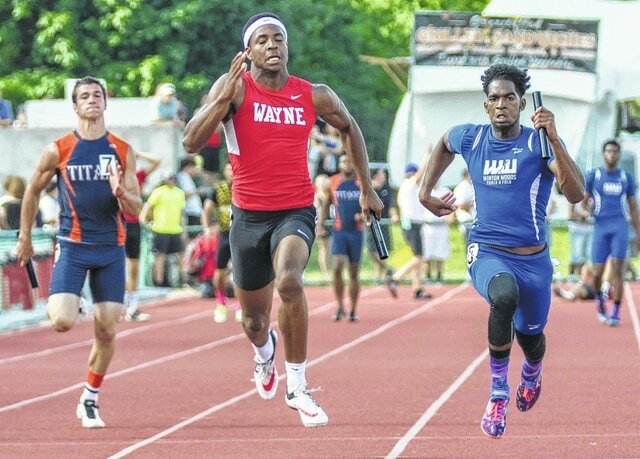 The Wayne 4×100 relay became only the fourth 4×100 team in school history to place at the state meet enroute to a fourth place finish in 42.26 on Saturday at the Jesse Owens Memorial Stadium at The Ohio State University. According to Wayne Coach Mike Fernandez, this 4×100 relay owns the third fastest time in school history, which was set in the regional finals at Welcome Stadium. This relay is composed of Alonzo Johnson, Hadith Tiggs, Tyree Kinnel and Ahmad Wagner. Fernandez indicated that the second leg of this relay, Tiggs, was the perfect person for this relay. In the third leg, Fernandez said that Kinnel had to literally leap into his last exchange with Ahmad, causing the senior to fall and roll in his lane.